Facebook is gigantic. To paraphrase Douglas Adams (albeit he was talking about space), you won’t believe how vastly, hugely, mind-bogglingly big it is. 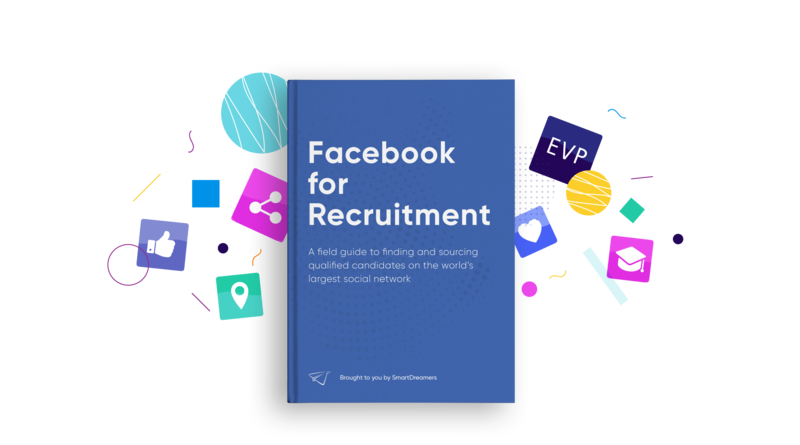 It boasts a total user base over 2 billion, and monthly active user over 1 billion, which represents a huge percentage of both passive and active job users all across the world—which means that the questions isn’t whether to use Facebook in recruitment efforts, but how best to take advantage of what the global social media giant offers. If you’re reading this article, it’s probably safe to assume that you already have a corporate Facebook page you use to share news and updates about your company. But do you also have a separate careers page for posting employer brand-related content? If not, you really should. Let’s back up for a second. In almost any discussion of Facebook, we have to bring up “The Algorithm,” i.e. the curation program that Facebook uses to determine who will be shown what piece of content at what moment. If, over the past few years, you’ve noticed that it’s become harder to earn organic reach with your posts, that’s because of broad changes to Facebook’s algorithm that make posts by businesses less likely to appear in the newsfeeds of regular users. Though this ostensibly improves the user experience, it does make things harder even for businesses that are following established best practices for reaching their target audiences organically. When deciding whether or not to display your content even to people who have already liked your page, Facebook is interested in a few things: how many likes, comments, or shares does the content have, and how relevant is it to the people who would see it if they increased its viewership? This is where the distinction between your corporate brand and your employer brand comes into play. If you’re posting a mix of recruitment marketing and traditional marketing content on your corporate Facebook page, any given post is likely to be relevant only to a segment of your audience. Sure, there are people who are interested in your company both as potential applicants and as consumers (and those people’s perception of your employer brand will affect their buying habits), but let’s assume that the majority of your followers aren’t. That means that each piece of employer branding content will be irrelevant to the consumer segment of your follower base, and vice versa—and Facebook will penalize you for that by showing your posts to fewer people. Given the difficulty of optimizing one page to reach two different audiences, most larger companies have adopted the strategy of utilizing a separate page for their employer branding. In this way, it's possible to create an audience that consists exclusively of Facebook users who are interested in learning more about your corporate culture, mission, and values, meaning that Facebook will deem your posts to be more relevant than they would be if they were targeted towards both potential buyers and potential applicants. The result, if you’re posting quality content, should be improved reach and engagement for both pages. This division of audiences will also be especially crucial when it comes to running advertisements and sponsored posts. Because Facebook gives businesses the option of targeting posts specifically to users who already follow or have engaged with your page, a more segmented audience can actually make your advertising more effective in terms of both cost (since Facebook’s price per click is determined in part by a “relevance score”) and lead generation. So, let’s say you’re interested in creating a standalone career page on Facebook. How do you get started? Essentially, the goal here is to share your company culture in a way that’s consistent with your employer branding, so that potential applicants can begin to envision what their day-to-day lives would be like working at your company (which, not coincidentally, is one of the top hurdles that candidates face in deciding where to work). This means that much of the focus of your posts should be on your team. Do you have photos of team members having fun at a recent company event? Post 'em! What about pictures of people engaged in the type of work that they love doing, or employees learning from one another’s expertise? Share those too! Again, the exact nature of what you post will be based on your employer brand and your employee value proposition (EVP). If your EVP is based in part on a cool, futuristic office space, you should present your audience with a lot of photos of that space, along with quotes from your employees on what it’s like to work there or what went into the office design. Conversely, if you’re attracting new recruits based on the chance to work closely with more experienced team members, present an image of two of your employees working in tandem. While visual content like photos and videos will form the backbone of your content strategy, it’s also useful to highlight some of your employees’ stories with testimonials and similar content. Remember: the best thing you can do is provide your audience with value. Yes, you’re trying to spread your employer brand, but you don’t want to come off as pushy, or seem like you’re only interested in making a sales pitch to potential employees. Consider offering helpful tips and information about your interview process, along with insight about what you look for in a candidate. Applicants appreciate transparency in the hiring process and also want to be prepared, so there’s no reason to be coy about what an ideal employee looks like to you. By giving information that will help them later down the line, you provide your followers with something of tangible value in exchange for their attention. The same goes for sharing links to articles with helpful insight into job hunting or career development from third party sources. Naturally, you should share any exciting, employment related news and articles from your company’s end, but if you’re posting multiple times a day (which you should be to maximize results), you’re going to want a lot of variety in your content. Keep in mind that these days any successful content strategy on Facebook really needs to be backed up with at least a small ads budget, but a strong Facebook career page can make a big difference when it comes to attracting the right candidates from social media.